It’s the early 1970s, a time of great social upheaval as the struggle for civil rights rages on. Ron Stallworth (John David Washington) becomes the first African-American detective at the Colorado Springs Police Department, but his arrival is greeted with open skepticism and hostility by the department’s rank and file. Undaunted by his treatment, Stallworth resolves to make a name for himself and a difference in his community. He sets out on a dangerous mission - to infiltrate and expose the Klu Klux Klan. Posing as a racist extremist, Stallworth contacts the group and soon finds himself invited into their inner circle. He even cultivates a relationship with the Klan’s Grand Wizzard, David Duke (Topher Grace). As the undercover investigation grows ever more complex, Stallworth’s colleague, Flip Zimmerman (Adam Driver), poses as Ron in a series of face-to-face meetings with members of the hate group, gaining an insider’s knowledge of a deadly plot. BlacKkKlansman is a film of conflict and contradiction. This movie is as much about love and hope as it is about hate and violence. It is both a comedy and a horror - unsurprising, perhaps, since Spike Lee was introduced to the story by Get Out’s Jordan Peele (who also produced the film). Featuring powerful performances from its entire cast (John David Washington and Adam Driver are superb), Lee’s film portrays a key moment in history, while also exposing issues that are (tragically) still so relevant today. This is a film that both looks and feels authentic (fantastic work from cinematographer, Chayse Irvin). BlacKkKlansman nails its period details - the sets and costumes are wonderful. Meanwhile, Terence Blanchard’s exciting score draws us in. 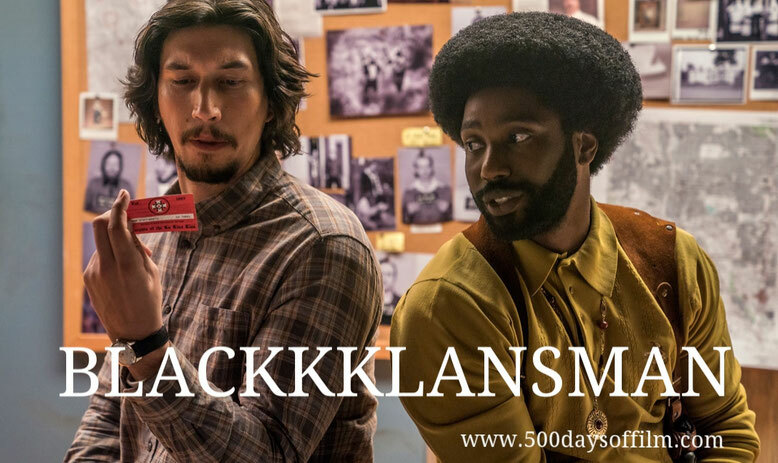 As BlacKkKlansman tells Ron Stallworth’s remarkable (barely believable) story, Lee’s film does include elements of fiction. However, the most incredible parts of the story are actually true. In a masterful balancing act, Lee’s film explores the world of Klu Klux Klan, while also inviting us to witness the (often horrific and heartbreaking) stories and speeches that inspired the Black Power movement. Perhaps most impressive of all, BlacKkKlansman conveys all of these conflicts and contradictions with a tone that is both laugh out loud (sometimes even slapstick) funny and also deeply shocking and upsetting. These contradictions allow BlacKkKlansman to be two things at once - a satisfying and enjoyable night out at the cinema and also a thought-provoking examination of American society - past and present. As a result, Lee’s film entertains even as it horrifies, it charms us (nearly) as much as it disturbs. BlacKkKlansman satisfies even as it leaves its audience with the terrible sinking feeling that, all these years on, the world is still plagued by racism. John David Washington is, of course, the son of Lee regular, Denzel Washington.